An Honors Scholar studies in the Honors Seminar Room in St. Charles Hall. 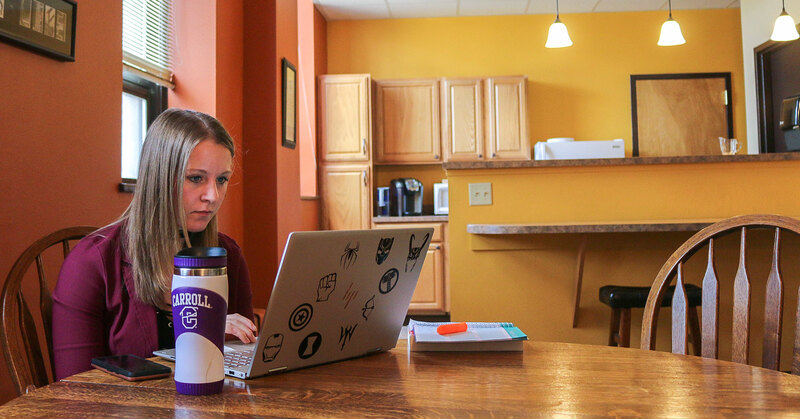 Carroll College's Honors Scholars Program is a highly selective academic program that approaches the liberal arts education by studying the great books of the western tradition. Carroll is truly a special place to pursue your education, and if you want to experience the best we have to offer in a liberal arts education, we encourage you to consider applying to our program. If selected, you will join a small group of students—usually, about eighteen—with whom you will experience the liberal arts in a unique way. While most students—at Carroll and elsewhere—enroll in general courses like philosophy or literature, you will participate in seminars that weave the disciplines together in a way that illuminates the compelling ideas that shape our world. While most students will be in courses where the professor sets much of the agenda for the course, you will work with your peers to shape discussions and engage in active inquiry. While most students will be in classes with students and professors that they may not see again, you will be with the same group during your 3 years in the Honors Scholars Program, learning from each other and building connections that, in our experience, last long after your time at Carroll comes to an end. Students studying together as they prepare for mid-term exams. And it’s worth noting that each seminar takes the place of a Core requirement at Carroll, so each seminar brings you one step closer to your Carroll degree. Our seminars are guided by three themes that make up the mission of our program: knowledge, charity, and the humanities. Our Honors Scholars explore the interrelations among these three concepts through a careful examination of the great books—books like Homer’s Odyssey, Dante’s Inferno, Galileo’s Starry Messenger, and Mary Shelley’s Frankenstein. By reading and discussing the most illuminating, provocative, and imaginative texts of the last three millennia, our students explore the claims and limits of knowledge, what duties humans have to their communities, and what most truly constitutes a human education. This broad and rigorous education pays dividends: our students are among the most successful at Carroll, and regularly gain entrance to professional and graduate programs when they enter the broader world. For all of these reasons, I encourage you to apply. Why Be an Honors Scholar at Carroll College? Need to contact someone in the Honors Scholars Program?